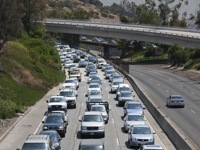 TUESDAY, May 8, 2012 (Health.com) — Are you sick of your commute to work? Bad news: It might actually be making you sick. According to a new study in three car-centric Texan cities, the longer your daily commute, the more likely you are to have high blood pressure, an oversized waistline, and other health problems that increase your risk for chronic diseases. "Long commutes really get under the skin in terms of affecting people's health," says lead author Christine Hoehner, Ph.D., an assistant professor of public health sciences at Washington University, in St. Louis. Hoehner and her team looked at some 4,300 people who live and work in the metropolitan areas of Dallas, Fort Worth and Austin, Texas. The researchers estimated the distance of each participant's daily commute, and they also collected data on health measures such as exercise habits, body mass index, waist size, cholesterol, and blood pressure. People with longer commutes tended to be less physically active, even after the researchers took into account extenuating factors such as age, race, educational levels, and family size. Seventy-six percent of people who worked within five miles of their home averaged at least 30 minutes of moderate-to-vigorous exercise per day (as federal health officials recommend), compared to just 70% of those whose commute exceeded 30 miles round-trip. In addition, people in the 30-mile-and-up club were more likely to be obese and to have an unhealthy waist size (40 inches for men, 35 inches for women). Excess belly fat is a known risk factor for diabetes, heart disease, strokes, and other serious health problems. Blood pressure appeared to be even more sensitive to commuting distance. Even people whose commute was just 20 miles round-trip had an increased risk of elevated blood pressure, which the researchers defined as the so-called pre-hypertension stage and higher. While it makes sense that sitting in the car takes up time that might be better spent at the gym, physical activity (or lack thereof) doesn't appear to be the only factor at work. When the researchers crunched the data, they found that a lack of exercise was largely responsible for the increased risk of obesity and excess belly fat associated with long commutes. Not so with blood pressure, however. Next page: Is traffic to blame? Hoehner and her colleagues can't say for sure what's driving the blood pressure finding. Contending with heavy traffic has been shown to cause stress, they note, and chronic stress can raise blood pressure. Another possibility is that long-haul commuters might skimp on sleep, eat more fast food, and engage in other unhealthy behaviors that weren't assessed in the study. Karol Watson, MD, a preventive cardiologist at UCLA's David Geffen School of Medicine, in Los Angeles, calls the new study "important" in that it "adds to the body of information about how the different things we do every day either reduce or increase our risk of heart disease." Dr. Watson can speak from personal experience. Each weekday for the past 15 years she has commuted one hour to and from work, and she's had to take steps to preserve both her mental and physical health, she says. "I skip the elevators and take the stairs at work—things like that add up in terms of exercise," says Dr. Watson, who keeps her mind occupied in the car by listening to podcasts and CDs about cardiology and medical research. "And I keep healthy snacks in the car, like little packs of nuts, which are good sources of protein and healthy fats. All you need is a handful." The new research, published today in the American Journal of Preventive Medicine, echoes findings from previous studies that have reported a link between poor health and sedentary behaviors such as watching TV and playing video games. Unlike those leisure-time activities, driving to work generally isn't optional, but that doesn't mean commuters can't find ways to sit less and move more during the day, Hoehner says. "You can't change your commute, or the fact that you are at a desk all day," she says. "Driving to work has long been a part of everyday life. Daily walks can be as well."